The major earthquake measuring 8.1 on the Richter scale which struck the Western Coast of Mexico on Thursday, 19 September 1985, generated a small tsunami. A major earthquake (aftershock or separate event?) 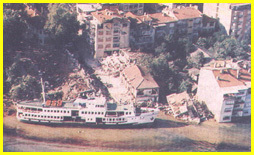 on 21 September, 1985 with magnitude 7.5 generated also a small tsunami. Both tsunamis propagated across the Pacific and were recorded by several tide stations in Central America, Colombia, Ecuador, French Polynesia, Samoa, and Hawaii. No reports of damage were received from any distant locations, and only minor damage due to the first tsunami was reported in the source region along the west coast of Mexico. A survey was undertaken by the author for the International Tsunami Information Center (ITIC) of the coastal area from Manzanillo to Zihuatanejo. Tsunami runup measurements were taken and interviews with local residents in the coastal areas were conducted. Subsequently, a survey of earthquake damage was undertaken in Mexico City. A source mechanism study of the tsunamis was subsequently conducted using seismic and geologic data and empirical relationships. Earthquake and tsunami energies were estimated and the tsunami generation areas defined. The earthquake energies were estimated to be 5.61 x 1024 ergs (10 raised to the 24 power) for the 19 September event while that of the 21 September event at 9.9 x 1023 ergs (10 raised to the 23 power). Tsunami energies were estimated to be 0.7 x 1020 ergs (10 raised to the 20 power) for the first event and 0.56 x 1020 ergs (10 raised to the 20 power) for the second event. The source area of the first tsunami was determined to be approximately one-half of the earthquake source area, or approximately 7,500 sq, km while the source area of the second tsunami was estimated to be equal to the earthquake area. The relatively small tsunamis generated by these large earthquakes are attributed to the shallow angle of subduction of the Cocos plate underneath the North American plate for this particular region, and to the small vertical component of crustal displacements. However, the angle of subduction increases further south and local earthquakes from that area have the potential of producing large tsunamis on the West Coast of Mexico. Earthquake of 21 September 1985 - The major earthquake which occurred 36 hours later on 21 September 1985 (the evening of Friday, September 20 local time), had a Richter magnitude of 7.5. Its epicenter was at sea, approximately 100 Km SE of the epicenter of the 19 September great event, also along the Michoacan gap. It is believed that this was a separate earthquake rather than an aftershock. Focal Depth - Both earthquakes had very shallow focal depths. 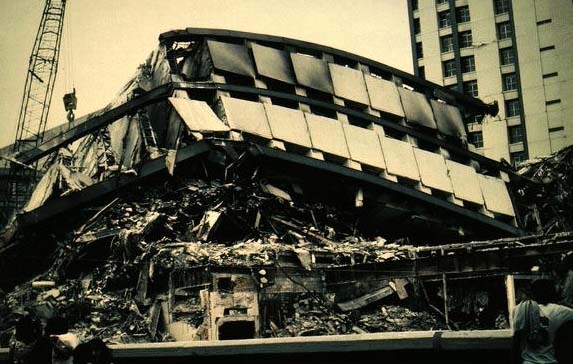 Extensive damage of the twelve-story high ,reinforced concrete building of the Ministry of Communications and Transport resulted in the near total collapse of long-distance communications between Mexico City and the rest of the world - thus complicating coordination of international rescue efforts. Earthquake Death Toll, Injuries and Damage - There was severe damage in several states of Central Mexico and in parts of Mexico City. According to official estimates, 10,000 people were killed, 50,000 were injured, and 250,000 people were left homeless. It is believed that the death toll was underestimated and that as many as 40,000 to 50,000 people may have lost their lives. In Mexico City alone 412 buildings collapsed and 3,124 others were heavily damaged. There was extensive destruction at Ciudad Guzman in the State of Jalsico, where approximaely 60% of all the buildings were either destroyed or heavily damaged. Extensive damage was also reported from other parts of the State of Jalisco as well as in the States of Michoacan, Vercruz and Morelos. A total of about 6,000 buildings were either destroyed or so heavily damaged that needed to be demolished. There were also reports of damage from landslides at Atenquique, in Jalisco, at Jala in Colima, as wells as along the coastal roads near Ixtapa. Total damage by the earthquake (and tsunami ) was estimated to be between 3- 4 billion U.S (1985) dollars. Most of the damage was caused by the earthquake. The Great Earthquake of 19 September 1985 caused strong ground motions which lasted for about three to four minutes - a rather unusual duration even for a great earthquake . 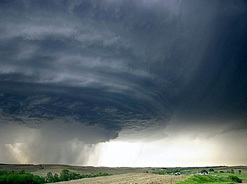 Strong shaking was felt over an area of about 825,000 square kilometers. Seismic intensities and accelerations differed from point to point depending on geologic conditions. The quake was felt by about 20 million people in Mazatlan, in the State of Sinaloa to Tuxtla Gutierrez in the State of Chiapas, and as far away as Corpus Christi, Brownsville, McAllen, Ingram and El Paso and Houston, in Texas and even in Guatemala City. Mexico City - Although the epicenter was more than 300 Km away, the valley of Mexico experienced surface seismic waves with ccelerations up to 17% g. with peaks concentrated at 2 sec. period (Quaas, et al, 1985). The maximum estimate of the Modified Mercalli intensity was IX. Considerable liquefaction and damage to new buildings occurred in Mexico City. 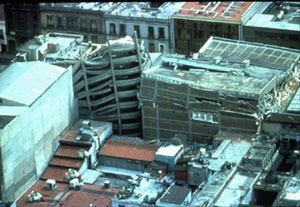 The extreme damage was attributed to the monochromatic type of seismic wave with this predominant period causing 11 harmonic resonant oscillations of buildings in downtown Mexico City which caused many buildings to collapse. These ground accelerations were enhanced within a layer of 30 ft. of unconsolidated sediments (of silt and volcanic clay) underneath downtown Mexico City, which had been the site of the historic Lake Texcocoa in the 15th Century. It is interesting to note that most of the buildings that were destroyed - or heavily damaged - were those that ranged between 8 and 18 stories in height - which perhaps suggests a resonance effect of the horizontal ground accelerations due to the short period ( 2-second ) seismic, surface wave. Playa Azul-Lazaro Cardenas - Ixtapa - La Union - Maximum registered intensity was IX in the region of Playa Azul-Lazaro Cardenas (Ortega, et al, 1985) and at Ixtapa and La Union. Ground fissures had predominant orientation in NW-SE direction. Liquefaction effects and sand craters were observed in the coastal region. Extensive ground fissures and sand craters were also observed in the coastal area of Ixtapa. Crustal Displacements and Rupture Lengths - The Great Earthquake of 19 September 1985 had two major ruptures. The horizontal displacements were estimated to be approximately 2.5 meters. A vertical displacement of 80 cm was measured in hard rock north of the city of Lazaro Cardenas. Measurements of crustal displacements were not available for the major earthquake of 21 September 1985. Earthquake Source Area - The 19 September 1985 earthquake affected an area of 185 x 75 Km2 or approximately 13, 875 Km2. The 21 September 1985 earthquake affected an area having approximate dimensions of 75 x 70 Km2 or roughly 5,250 Km2. A total of 63 aftershocks were roughly recorded ranging in magnitude from less than 3 to more than 5. All of them had depths of 60 Km or less. Earthquake Focal Mechanism - The focal mechanism of this earthquake corresponded to reverse faulting and was poorly controlled. The seismic history and seismic potential of this Michoacan gap have been uncertain and controversial in the past, until this event. Data from first motion instruments indicated that the main event was on a very shallow plane, which is typical with the direction of subduction of the North American plate. According to Cal Tech, long period, P-wave data, the depth was 17 Km for the hypocenter of the main event, while the depth of the major aftershock was 22 Km. Also, long period seismometers indicated that the main event resulted from two separate sub-events separated by a time lapse of 27 seconds. The overall duration was much longer than that of past events. Earthquake Energy - Energy flux calculations (Anderson, et al, 1985), based on strong motion records of the main earthquake, indicated a low dynamic stress drop, and when observed heat flow is taken into consideration, a low absolute interplate stress. (3) Log10 E = log10 l + 22.53 , or E = 3.3 x 1022 l in ergs. 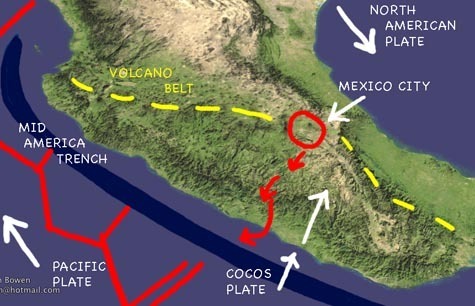 The Middle America Trench defines the boundary between the Pacific, Cocos, and Nazca plates as they subduct beneath the North American and Caribbean plates. The Trench has been formed by an active subduction process and stretches from central Mexico to Costa Rica for about 1700 miles (2,750 km). The segment of the trench (fronting the city of Acapulco) is known as the Guerrero seismic gap. The last earthquake along this particular gap was in 1911, so this area had and continues to have, a high probability of recurring large earthquakes (Anderson et al., 1985). The 19 September 1985 and the 21 September, 1985 earthquakes occurred along a segment that is characterized by a low angle of subduction. Recent Earthquakes - In the 20th century, Mexico had about 42 earthquakes with magnitudes greater than 7. Both earthquakes had their epicenters at sea. The first earthquake of 19 September, in spite of its large magnitude, produced a rather small tsunami. Movement in the vertical plane (0.8m) was relatively small, the angle of subduction was shallow , and volumetric displacement of the crustal block underneath the ocean was relatively small. The major aftershock (or separate earthquake) of 21 September 1985 had its rupture and its crustal displacements further out to sea. Its subduction angle may have been somewhat steeper underneath the North American plate, thus having a larger vertical component. Although it affected a smaller area and had displacements for only 50 Km, in terms of tsunami generation, it may have been more efficient. This is illustrated by the Acapulco tide gauge record in which both tsunamis of 19 and 21 September registered almost equally, in spite of the large difference in earthquake magnitudes. However, the source area for this second event was closer to Acapulco. The survey of the coastal area affected by the tsunamis of the 19 and 21 September 1985 earthquakes covered the west coast of Mexico from Manzanillo to Zihuatanejo. Runup measurements were made and interviews with local residents in the coastal areas were conducted. The tsunami measured from 1 meter to approximately 3.0 meters from Manzanillo to Acapulco. The tsunami caused some damage at Lazaro Cardenas, at Zihuatenejo and at Manzanillo. Tide stations recorded maximum wave heights (peak-to-trough) of 1.4 meters at Acapulco, Mexico. There were some reports that some ships off the Pacific coast of Mexico observed unusually heavy seas near the time of the earthquake. However these waves may have been caused by local storms. Manzanillo - A tsunami height in the order of 1 meter was reported. Zihuatanejo - Maximum wave heights of approximately 3.0 m were measured . Lazaro Cardenas - This was the town closest to the epicenter where the maximum tsunami height was estimated at approximately 2.8 meters, with inland inundation of up to 180 feet. Tsunami damage to coastal structures, due to the effects of flooding and erosion, was relatively minor. As indicated previously (see diagram of estimated tsunami generating areas), the total area affected by the 19 September earthquake had approximate dimensions of 185 x 75 Km2, or 14,000 Km2. Approximately one half of this area was in the ocean, so effectively the tsunami generating area was only 7,500 Km2, which is only a small fraction of the ocean floor area usually affected by large earthquakes. For example, the Great Alaskan earthquake (M=8.5) affected a total area of approximately 215,000 Km2 and the tsunami generating area was in the order of 175,000 Km2 (Pararas-Carayannis, 1972), or approximately more than twenty times greater than the area affected by the 19 September Mexican earthquake. This partly explains the relatively small tsunami generated by this large Mexican earthquake. The 21 September earthquake, although much smaller in magnitude (M=7.5), affected a smaller area estimated at 75 x 70 Km2 or approximately 5,000 Km2. However, all of the affected area was in the ocean, so the tsunami generating area was also approximately 5,000 Km2. The records of the tsunamis from the two events as recorded in Acapulco, show that the second event produced a tsunami which was very similar in size to the one generated by the larger event. This indicates that the efficiency of tsunami generation of the smaller event may have been greater than that of the larger event. The energy transfer of the earthquake to tsunami energy cannot be calculated directly because there were not extensive measurements of the crustal displacements associated with either the 19 September, or the 21 September earthquakes. The crustal measurements given have been inferred from first motion instruments. For the major quake, it is assumed that horizontal movement was 2.5 m, and vertical displacement was 0.8 meters. Based on these quantities and on the geometry of faulting, an estimate of the tsunami energy was obtained as follows. This is based on the assumption that the vertical displacement for the second earthquake was also 0.8 m. However, inspection of the Acapulco record shows that both tsunamis were of the same approximate height. Therefore, the second earthquake must have been more efficient or had an angle of subduction that was greater, so the vertical component of the crustal movement could have been more than 0.8 m, and the tsunami energy proportionately greater. Can earthquakes along the Western coast of Mexico generate destructive tsunamis? 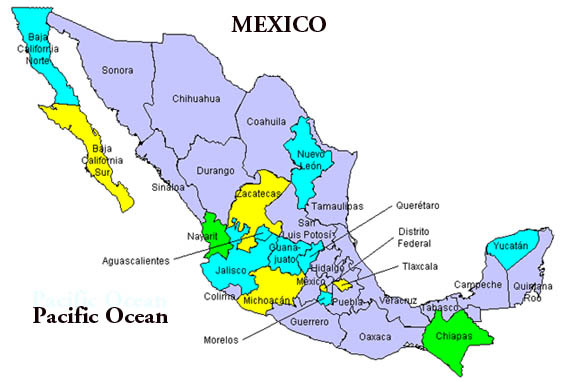 The perception that tsunamis do not pose a threat in Western Mexico is erroneous. The historic record shows that about 15 destructive local tsunamis were generated in the last three centuries, (SoLoviev and Go, 1975) from earthquakes along the Middie America Trench. The wave heights of these tsunamis has ranged from 2 meters to a maximum of 9 meters. Singh, K.S., Ponce, L. and Nishenko, P.S. "The Great Jalisco, Mexico, Earthquake of 1932: Subduction of the Rivera Plate. ", "Bulletin of Seism. Soc. Amer., Vol. 75, No. 5, pp. 1301-1313, October 1985." 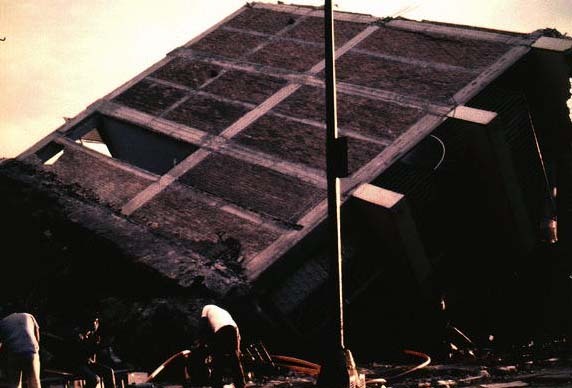 Anderson, J., Bodin P., Brune, J., Masters, G., Vernon, F., Almora, D., Mena, E., Onate, M., Prince, J., Quaas, R., and Singh, K. "Strong Ground Motion and Source Mechanism of the Mexico Earthquake of September 19, 1985," Proceedings "Simposio El Temblor De Michoacan 1985 y Sus Efectos" Oaxaca, Un. Geof. Mexicana - Instituto Technologico De Oaxaca, 10-16 November 1985. Astiz, L., Eissler, M. and Kanamori, H. "Source Parameters of the September 1985, Mexico Earthquakes" Seismological Laboratory, Cal Tech, Pasadena, Proceedings "Simposia El Temblor De Michoacan 1985 y Sus Efectos" Oaxaca, Un. Geof. Mexicana - Instituto Technologico De Oaxaca, 10-16 Nov 1985. Bodin, P. and T. Klinger. Observations of coasta I uplift associated with the 1985 Mexican subduction earthquakes (abstract), American Geophysical Union, Fall Meeting, San Francisco, California, 1985. Iida, Kumizi "Magnitude and Energy of Earthquakes Accompanied by Tsunami and Tsunami Energy." Journal of Earth Sciences, Nagoya Univ., Vol. 6, No. 2, pp 101-112, Dec. 1958. Gonzalez-Ruiz, J., C. Rebeltar, and K. McNally. Preliminary source characteristics of the September 19/20, 1985 MEXiC0 earthquake from body wave observations, Additional Abstracts to E.0.S., Transactions American Geophysical Union, PP. 98, 1985. Gutenberg, B. and Richter, F.C. "Seismicity of the Earth and Associated Phenomena," 2nd Edition, Princeton Univ. Press, Princeton, New Jersey, 310 pp, 1954. Pararas-Carayannis, G. "Source Mechanism of the Water Waves Produced." Reprinted from Pacific Science, Vol. 21, No. 3, "A Study of the Source Mechanism of the Alaska Earthquake and Tsunami of March 27, 1964." Volume on Seismology and Geodesy on the Great Alaska Earthquake of 1964, National Academy of Sciences, Washington D.C., pp 249-258, 1972. Pararas-Carayann Is, G. A summary of findings of the ITIC mission in Mexico sponsored by the Intergovernmental Oceanographic Commission (UNESCO), 6 PP. manuscript, International Tsunami information Center, December 1985. 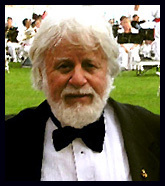 Preuss, J., R. Preuss, A.J. S&nchez, and S.F. Farreras. Update on tsunami effects of the September 1985 Mexico earthquake, Tsunami Newsletter, XiX, 2:7-9, Juiy 1986. Singh, S.K., L. Astiz, and J. Havskov. Seismic gaps and recurrence periods of large earthquakes aiong the Mexican subduction zone: a re-examination, Bulietin of the Seismological Society of America, 71:827-843, 1981. Singh, S.K., M. Rodriguez, and J.M. Espindosa. A catalog of shallow earthquakes of Mexico, 1900-1981, Bulletin of the Seismological Society of America, 74:267-279, 1984. Soioviev, S.L. and Ch.N. Go. A catalogue of tsunamis on the eastern shore of the Pacific Ocean (1513-1968), 204 pp., Moskow , USSR: Nauka Pub. House, 1975. UNAM Seismology Group. The great Michoacan, Mexico earthquake of 19 September 1985: some seismological aspects (preliminary resuits) , Abstracts of the American Geophysical Union Meeting, San Francisco, California, 1985.